SEA BRIGHT, N.J. (WABC) -- A teenage swimmer rescued from a rip current along a beach in northern New Jersey Monday is listed in critical condition. 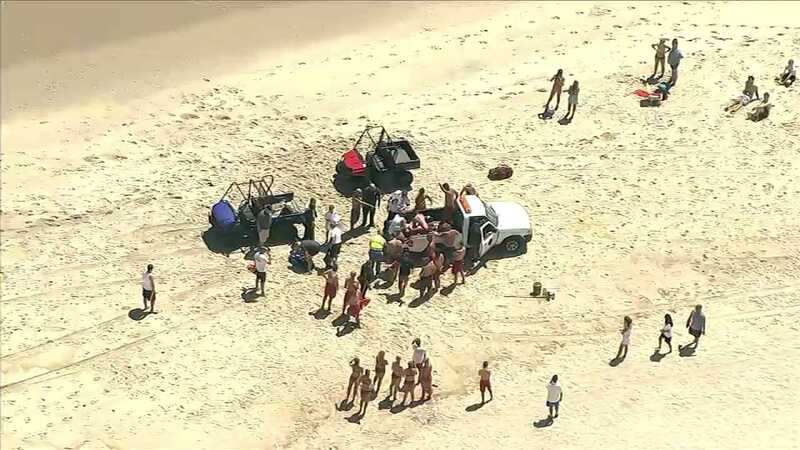 He was one of two people caught in the current around noon near a section of the beach does not have lifeguards in Sea Bright in Monmouth County. The two teens were with a group of about a dozen friends on an unguarded, private beach, next to the Driftwood Beach Club. They were allowed to be there, officials said. When the group started screaming that their friends were caught in a rip current, the lifeguards from the club responded and pulled out one teen, who did not need medical attention. About 20 minutes later, the 18-year-old was found and pulled from the water. Officials said he initially didn't have a pulse, but lifeguards performed CPR to revive him. The teen was taken to Monmouth Medical Center where he remained in critical condition on Monday afternoon. Lifeguards said a red flag warning for dangerous rip currents was issued on Monday. People are only allowed into the water up to their ankles.